A regular general meeting of the association consisting of those involved in fishing industry in Okinawa on July 30. 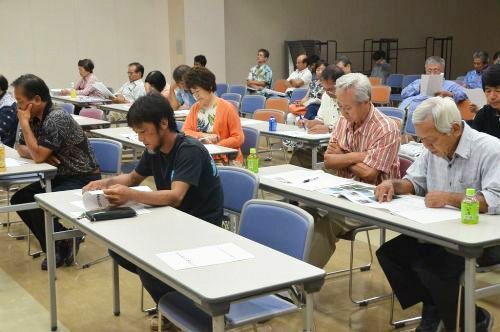 An association representing people involved in the Okinawan fishing industry who oppose construction of a new U.S. base in Henoko, Nago, held a regular general meeting in Uruma City on July 30. The association unanimously passed a special resolution seeking the withdrawal of the U.S.Marine Corps from Okinawa and the halting of construction of the new base in Henoko and helipads in Takae, Higashi Village. The association was set up in May 2015. At the meeting, the association members reported several projects involving fixed-point observation of coral reef for the fiscal year of 2015. They confirmed that they would continue opposing new base construction in Henoko. The East Asian Community Institute, for which former Prime Minister Yukio Hatoyama is president, will display the resolution in English at a photo exhibition about issues related to the Henoko relocation, which will be held in Berkeley, California on August 11.